Our team is dedicated to family and fun in the Kamloops area. Our doctors are active in the great outdoors, and they appreciate a healthy lifestyle. Sunny Shores Dental consists of our primary dentists and a team of hygienists, as well as administrators who will greet you with a smile before discussing what it is that your smile needs! Read on to learn about who we are. Dr. Vitoratos received his Doctor of Dental Surgery degree from McGill University in 1997. While attending, he received the Paul A. Marchand award that is given to someone demonstrating the highest degree of professionalism in clinical dentistry. Dr. Vitoratos also has an extensive background in Immunology, gained through McGill University's Faculty of Science. During his postgraduate program at McGill, Dr. Vitoratos completed a hospital residency at the Montreal Jewish General Hospital. During this time, Dr. Vitoratos was able to further his knowledge of surgical dentistry and the administration of anaesthetic dentistry. He learned proper care techniques for treating children, and people with physical and mental hindrances. At this time Dr. Vitoratos also learned about IV sedation dentistry. Dr. Vitoratos was the department head of dentistry for the Williams Lake Cariboo Memorial Hospital, a title he has held for over fifteen years. He is currently the department head of dentistry at the Kamloops Royal Inland Hospital and the Kamloops Surgical Centre. Dr. Vitoratos is passionate about the education and execution of surgical and cosmetic dentistry, including implant dentistry. He is always willing to learn more, and is never satisfied with knowing "just enough". He has dedicated himself to evolving his comprehension of dentistry techniques alongside the evolution of dentistry itself. 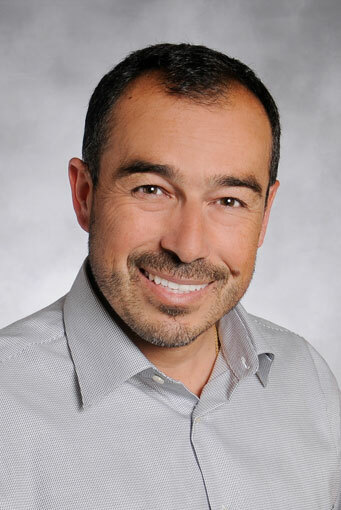 Dr. Vitoratos is a graduate of the Kois Centre for Advanced Dentistry, and he is a member of the British Columbia College of Dental Surgeons, the Canadian Dental Association, the Academy for Sports Dentistry, and holds his Fellowships degree from the Academy of General Dentistry. Like the rest of the Sunny Shores Dental team, Dr. Vitoratos is a family man first, and he wishes to treat your family as he does his own. He can converse with you in English, French, Italian and Greek, and he'd be happy to tell you all about his wife and two young children. His home also has a pair of energetic dogs and a lethargic, privileged cat. Dr. Vitoratos and his wife Martine moved to Kamloops after practicing in Williams Lake, where they had a successful dentist office for more than seventeen years. They now live in the Kamloops area to provide new educational opportunities for their children, while enjoying their love of the outdoors. When spending time in nature, the Vitoratos family enjoys triathlons, swimming, mountain biking, skiing, kayaking, golfing, fishing, hunting and hiking. For a slower pace, they participate in the arts, especially music and painting. Dr. Vitoratos is proud of his accomplishments in his field, and he wants to put them to use in the Kamloops area, providing the quality, family-oriented dental care that he has become known for. Dr. Foo grew up in Vancouver and received his Bachelor of Science degree in Microbiology in 1993 and his Doctor of Dental Medicine degree in 1997 from the University of British Columbia. After an associateship in Trail, B.C. he arrived in Kamloops in 1999, attracted by its great outdoor opportunities and unpretentious people. He shared a friendly and helpful approach to dentistry with Dr. Paul Cavaghan and became owner of his dental practice. Over the next eighteen years, Dr. Foo devoted his life to ownership of his dental practice. The hours put into day-to-day business tasks took their toll. In 2017 Dr. Foo elected to change his role to associate practitioner, in pursuit of a healthier work-life balance and to develop his interest in excellent dentistry. Working with Dr. Vitoratos is giving him time and opportunities to stimulate his professional background and to diversify his personal hobbies. Dr. Foo is excited to continue in the service of our patients, and has no plans to retire or slow down—eighteen more years would be great! He remains a dedicated part of the Sunny Shores Dental team, proud to offer honest advice and caring treatment that places our patients first. He has over twenty years of experience as a gentle and kind practitioner who makes conservative, unbiased treatment recommendations. You’ll enjoy his friendly, patient, relaxed manner. Dr. Foo would love to meet you. Our team at Sunny Shores Dental is made up of caring, professional employees who are eager to meet you. You can call our office and speak with Denise, Sandy, or Annette, our friendly front office staff. From there you can book an appointment with our hygienists Colleen and Penny. You can consult with our CDA team, led by Jacynth, Valerie, Michelle and Elizabeth. Of course, if you need professional treatment, you can sit in the chair of Dr. Vitoratos or Dr. Foo. If you have any questions or concerns beyond the health of your teeth and gums, you can speak with our dependable office manager Annette.